F.A.Q. About Motor Oils. 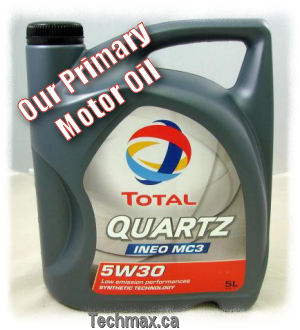 TOTAL synthetics motor oils. Total S.A. produce all the base components for their Synthetic motor oils. Q. What do the numbers on the front of the bottle mean? A. The viscosity numbers are divided into low temperature (0,5,10,15,20W) and high temperature (20,30,40,50) ranges. High temperature numbers are based on the kinematic viscosity measured at 100 Celsius. Q. I heard some synthetics are just fancy mineral oils, is that true? A. It's true that some oils called 'synthetic' are comprised of severely refined mineral base stock. These oils do offer performance benefits compared to mineral oils, but most importantly, provide a de facto upgrade standard that is not available under the API licensing system. Q. What kind of synthetics oil does Total use in their oils? A. Total S.A. is proud to produce all the base components used in their synthetic motor oils. Depending on the application, Total motor oils are comprised of combinations of Group III, IV and V base oils, each according to the specific requirements. A. S.A.P.S. stands for Sulphated Ash, Phosphorus and Sulphur. They are some of the critical components of an engine oil additive package but they also poison 3 way catalysts and diesel particulate filters. Oil standards have mandated lower limits and additive companies have been working to find ways to maintain the anti-wear and detergency performance of the oil without them. Q. How can Viscosity Index enable a 5w30 to do the work of a 5w40? A. A light oil + high V.I. is able to be thinner at 0 Celsius, 40 Celsius and 100 Celsius yet be comparable at 150 Celsius to a heavier + lower V.I. oil. Grade Vis @ 40 Celsius Vis @ 10 Celsius API HTHS Spec HTHS VW 502 00 Vis @ 150 C.
A. S.A.P.S. stands for Sulphated Ash, Phosphorus and Sulphur. They are some of the critical components of an engine oil additive package but they also poison 3 way catalysts and diesel particulate filters. Oil standards have mandated lower limits and additive companies have been working to find ways to maintain the anti-wear and detergency performance of the oil without them. Q. Why do European cars have such a long oil change interval? A. The ACEA was created with a mandate to increase the quality of the oil being used in the marketplace. Their approach was to also increase the working lifespan of the oil to maintain the cost/km value of the oil. This drove the development of base oils and additive packages that are approved up to 50,000 kms in specific applications. Q. Why don't American or Asian manufacturers recommend such long intervals? A. North American and Asian Import manufacturers have been quietly increasing their oil change intervals as API standards have improved the quality of the standard oils on the market. The next round of oil standards will enable another increase due to continued improvements in volatility, oxidization and deposit control. Q. Why do most quick lubes recommend changing oil every 5,000 km? A. Unknown to the consumer is the fact that the refining of crude oil produces an excess of lubricant base oil vs. gasoline/diesel fuel. 73 liters (19 gallons) of gasoline. 2L (0.5 gallon) of engine oil base stock. The average car, meeting current CAFE standard of 27.5 MPG, driven for 5,000 kms (3,125 miles) would require 432 liters (113.64 gallons) of gasoline during which time 11.5 litres (3 gallons) of engine oil base stock will have been produced. The average oil change requires 3.8 liters (1 gallon) of engine oil, leaving a 7.6 liters (2 gallons) surplus. Modern engine oils are fully capable of living for more than 10,000 kilometres in a well tuned engine driven under normal conditions. Severe use such as very short trips, winter conditions, excessive idling, poor tuning or towing place greater stress on the oil and warrant a shorter change interval. 1. All Canadian driving is considered severe Counter: Recommendations from North American auto manufacturers (North American auto manufacturers- not European) are for climatic conditions in North America, severe conditions in both northern and southern regions are taken into account. 2.Oil is cheaper than a motor. Counter: While there will be no damage caused by more oil changes, the environmental impact of unnecessary used oil is a high price for the false sense of security it gives. The oil recommendations of the N.A. and Asian manufacturers is based on API approved mineral oils. Upgrading to a synthetic product, particularly an ACEA approved one like use TOTAL Synthetics Motor Oils, will provide an extra margin of performance over the full recommended interval. If you have any related question, please give us a call to 905.795.0419 or visit us in person. Copyright © Techmax Auto Repair Inc.